Analyzer comes pre-configured with all of the reports needed to analyze the quality of your schedule. In addition to our innovative scorecards, Analyzer includes schedule validation reports, government standard checks, comparison reports, schedule performance reports, and reports you can customize and build from scratch. The Defense Contract Management Agency EVAS Metrics and 14 Point assessment are a series of checks that help ensure that your schedule has a trustworthy critical path. Steelray Project Analyzer explains the results in an easy to understand format. Steelray Project Analyzer includes The Coach, a built-in encylopedia that dives deeper into your results, explaining the findings in simple terms. For some users, The Coach teaches them the fundamentals of schedule quality. For others, it serves as a quick reference. When tasks are flagged by Analyzer, simply click on a hyperlink to filter those tasks in the native scheduling application (e.g. Microsoft Project, Primavera P6). Steelray Project Analyzer provides a smooth workflow to fixing schedule quality issues. Generating reports in Microsoft Office is a breeze with Project Analyzer. Analyzer includes reports that directly create Microsoft Excel, Word, and Powerpoint files. Output from any report can easily be copied into existing or new Office files. Improvement: Updated DCMA 14 Point Assessment to exclude inactive tasks. Improvement: Notification added for Critical Path Length Index criterion (14 Point Assessment Report) when the project's status date is not set. Bug Fix: GAO Excel export updated to exclude inactive tasks. Improvement: Added Critical metric to several criterion on the Dynamic Schedule Compare report. Bug Fix: Fixed issue where inactive tasks were not being properly handled in some criteria. Improvement: Numerous aesthetic improvements to the Enterprise Grouped Matrix Report. Bug Fix: Previously, when running the Hard Constraints report before any other reports resulting in output in the \AppData\Roaming\Steelray Software\Steelray Project Analyzer\Document Output\ directory, the results would fail to write. New Feature: Project Server providers have been renamed to reflect which version of the provider should be used with corresponding versions of Project Server. For volume discounts, please contact Steelray Sales. Steelray Viewer is the leading tool for project professionals who need to analyze Microsoft Project or Primavera P6 schedules. I have to tell you how much analyzer has helped me. I have cut my analysis time by 80%. I let Steelray Project Analyzer do it for me. My engineering group loves the Excel output. Steelray Project Analyzer was developed with the end user in mind. I have been using this tool for a few years now and have been impressed with its ease of use and robust functionality. Project Analyzer has matured with technology by adapting to the latest versions of the products it supports. Additionally, the professional manner in which their customer support staff works with the user is top notch. Analyzer is well thought out like they had been in my arena for the past 10 years. They really knew what issues the end user would have. Why Use Steelray Project Analyzer? Large projects require complex schedules that affect the plans of many people—not just project resources, but finance, management and a host of interdependent departments and entities. It’s critically important that the schedule be as accurate as possible so companies can save effort, reduce budget and enable teams to deliver on time. Unfortunately, complex schedules in complicated scheduling software (like Microsoft Project and Primavera) are prone to errors in the critical path. This makes it difficult to trust the forecast—which undermines confidence in the program. Brings confidence to the schedule. Analyzer is the only solution to use statistically validated measures. Analyzer offers the most comprehensive repository of best scheduling practices, gathered from a large community of project managers across diverse industries. Analyzer can tackle larger and more complex project schedules than any other solution (which is why some of our best customers are actual rocket scientists). Analyzer’s simple, frictionless interface makes it the easiest solution to use, resulting in shorter time-to-results and greater cost savings. Analyzer makes better schedulers with its built-in encyclopedia of schedule quality. Analyzer uncovers issues far beyond the DCMA 14-point assessment, so you’re more likely to pass an audit and you’ll save the headaches of schedule hold-ups and lost revenue. As the number one schedule quality tool, Analyzer is frequently a skill listed on schedule analyst job descriptions and resumes. Analyzer is a product made and supported by passionate, highly skilled US-based developers, dedicated to great service. What is Steelray Project Analyzer? Steelray Project Analyzer is software that takes the pain out of creating, maintaining and delivering quality schedules. 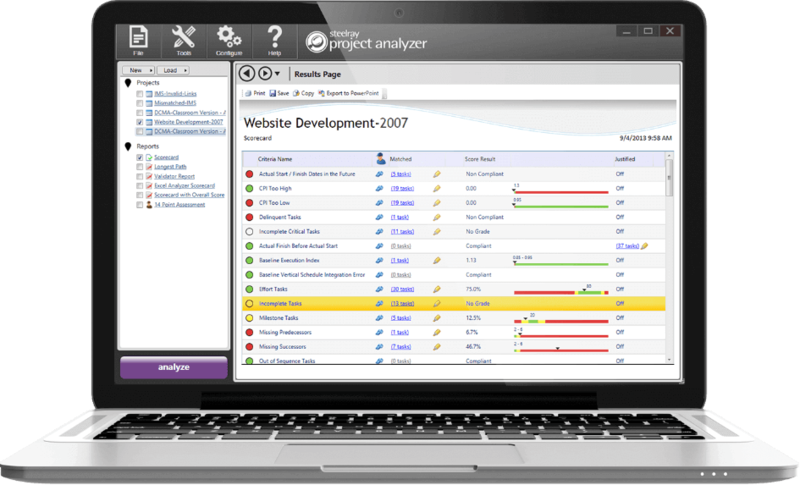 With Analyzer, you can evaluate your project schedule for quality and performance in minutes and produce understandable results. Schedules can be analyzed against project management best practices, internally defined best practices and government best practices. Analyzer supports Microsoft Project .mpp files, Project Server, Primavera P6 and UN/CEFACT XML. Scheduling software makes it relatively easy to create schedules and calculate a critical path, but it doesn’t do much to prevent common mistakes that result in an incorrect critical path. Overuse of hardcoded start and finish dates, instead of letting the scheduling software calculate them. Neglecting to sequence tasks with other tasks they depend on (or that depend on them). Improperly using features of the scheduling tool (EX: adding “lag” to tasks to manipulate start dates). Think about it: the purpose of scheduling software is to produce a good critical path, and almost all medium-to-large schedules contain mistakes that make the critical path incorrect. Suppose a company brought you in to consult on a large project they were launching. On your first day, they give you project schedule with a finish date of December 15th that year. You load the schedule into Analyzer, run a scorecard report, and Analyzer flags six crucial problems with the schedule. So you meet with the scheduler and stakeholders, modify the schedule and run it through Analyzer again. Now there are no longer any problems, but the finish date is February 15th, two months later than the original forecast! The impact? You now have valuable, up-front information about the truth of the schedule—and can do something about it—several months before misinformation would have lead to the headaches of time and cost overruns.